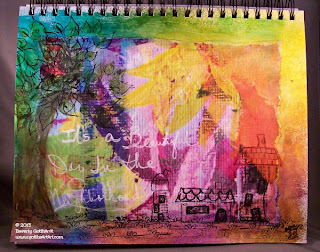 Carolyn Dube at A Colorful Journey gives her email subscribers an Art-spiration each month. I should have taken a picture of the art-spiration that I printed out to alter, but I got ahead of myself with this idea. I'll do better next month. The main inspiration is in the middle. I first sprayed the journal page with Dylusions Sprays, then collaged the art piece on. I stamped the houses, the grass, and the leaves of the trees with Ranger Dylusions stamps. I used Faber-Castell Big Brush pens to make the tree trunk, add some sun rays, do some colorings, and outlining, then a white Stabilo pencil to add the words in my handwriting. Click over to her blog and subscribe to have some fun at Mixed Media. Wow--this is wonderful! I love the colors in this piece. Only one problem with it for me...now the theme song from "Mister Roger's Neighborhood" is running rampant through my mind LOL.